The next TJBS Great Albums Concert is set to take place Sunday, May 27, 2018 at 7 pm in The Lounge at the City Winery. 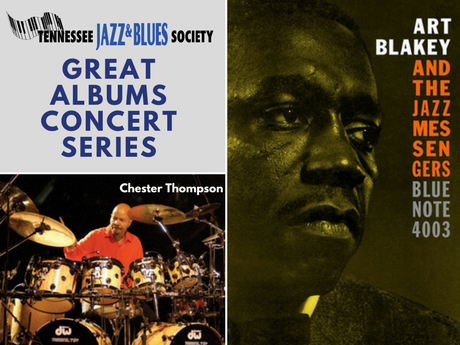 May’s Great Album highlights the Art Blakey classic ‘Moanin’ performed by acclaimed drummer Chester Thompson. Joining Chester will be trumpeter Rod McGaha, saxophonist Rahsaan Barber, pianist Chris Walters and bassist Jack Aylor. In 1995, Chester Thompson and his family moved from L.A. to Nashville. He is known for a very successful playing and recording career with such artists as Weather Report, Frank Zappa, George Duke, Phil Collins, Genesis and many more. Chester is on the faculty at Belmont University in Nashville. He is very much in demand in the studios, and is constantly traveling to do clinics and master classes. Chester teaches drumset classes and ensembles at Nashville Jazz Workshop, and has also served on its Board of Directors. The Lounge at City Winery has comfortable seating and great acoustics where patrons can enjoy great dinner selections and cocktail options while seeing the show. Doors open at 5 pm and the concert begins at 7 pm. Unlike previous Great Album concerts, there will be only one performance during the evening. Tickets are $20, $15 for TJBS members, available on the City Winery website. Members will receive the code via email.